The simplest way to bring up a job is if the cellar hand has a paper copy of the work order. They just need to scan the barcode on the top of the note with the scanner and a list of jobs from that note will appear. By default this will show you the barrel jobs for the current date. You then select a job by tapping it and then tapping Select Job. 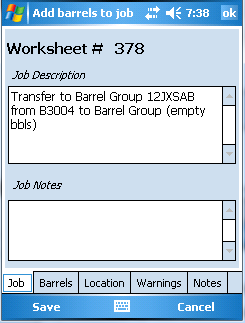 Some jobs will require barrels to be verified. So that all barrels selected by the winemaker in creating the work order should be scanned by the cellar hand. The cellar hand starts scanning and the scanner will highlight barrels in the Barrels tab that have been selected. If any barrels not in the list are scanned, a warning will appear. As such, it is good practice to scan the barrels prior to making additions etc as this can pick up some mistakes. Other jobs such as filling barrels will add barrels to the job when barrels are scanned. This will build up a list of barrels in the Barrels tab which will automatically be added to the job when it is Saved/Completed in vintrace. 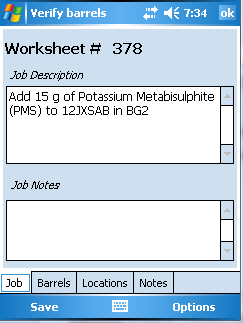 Once the barrels for a job have been scanned and the work completed, the cellar hand can update the details in the Location tab for the location of the barrel group, and add additional notes if applicable. Then the cellar hand taps the Save button.